Lord Saladin’s Iron Banner is Destiny’s level-advantage PvP activity, putting the strongest wolves against each other in a competitive skirmish. For season six, Jokers Wild, Iron Banner returns with two new consumables – Iron Burden and Wolf’s Favour. The two items represent drastic changes to the PvP scene. Iron Burden reduces a players power level by 100, putting them at a significant disadvantage to other guardians in the Crucible. The debuff also carries a high reward – if you defeat 500 opponents while Iron Burden is active, you’ll receive a masterworked Wizened Rebuke with a curated role. Progress towards the weapon will carry over throughout this season’s Iron Banner. For those of us struggling to raise their power level, or who tend not to dabble in the delights of PvP, Wolf’s Favor will increase your power level by 100, up to a cap of 700, for 30 minutes. Bungie’s aim is to include more players in the activity by helping them stay competitive. The consumable has a chance to drop from strikes, nightfalls, flashpoints, gambit, daily heroic story missions, and select weekly milestones. Talking of milestones, following Bungie’s weekly update, the stats are finally in, pledges counted, and sides taken. It seems the Drifter and his dark ways have encouraged 69.9% of the player-base’s guardians to swear their allegiance to him – with just 30.1% staying true to the Vanguard. Additionally, the rogue lightbearer won 74.9% of the playerbase’s first vote on which side they pledge allegiance to in this battle of dark vs light. 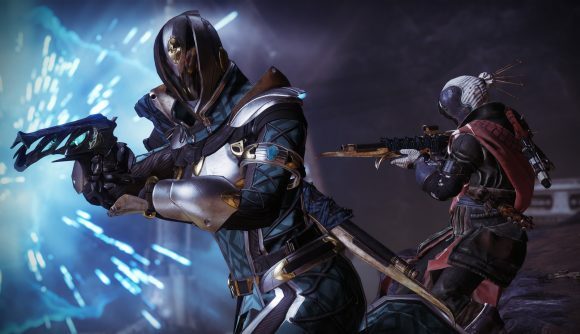 The figures come as no surprise as Bungie’s narrative-altering questline has added some flavour to the Destiny universe, with the majority of players choosing to switch-it-up and embrace the dark.